This work is part of a recent series dubbed "Observeillance" that delves into the implications of being surrounded by the omnipresent web of surveillance that is a fact of life in our present day ‘State of Worry.’ These works allude to the psychological unease inherent in being watched incessantly, almost everywhere in public space. This network of relentless observation is ostensibly there to guard us from ‘evil’ or harm, but the insidious aspects of potential control and lack of privacy lurk beneath the ‘protective’ surface of the systems that daily watch over us. 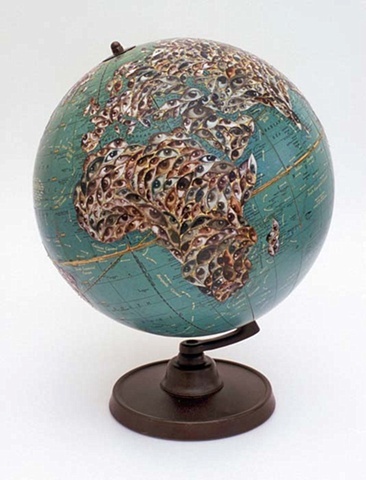 This altered globe is a reaction to the ever-increasing exposure via the searching eye of Google Earth, which seems to be everywhere these days, crawling all over the planet like a swarm of insects. 13" x 10.5" x 10.5"